Joab (יוֹאָב "The Lord is father," Yoʾav) was a key military leader under King David in the Hebrew Bible in the late eleventh and early tenth centuries B.C.E.. One of David's nephews, he was the military power behind David's throne, winning many crucial battles on David's behalf. 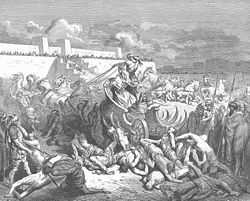 For example, he led the charge against the fortress town and David's future capital of Jerusalem; engaged in effective siege tactics against national enemies such as the Edomites, Ammonites, Moabites, and Syrians; and helped put down two serious internal rebellions, including the civil war instigated by David's treacherous son Absalom. He also assisted David in the murder of Uriah the Hittite, the husband of David's lover, Bathsheba. While Joab's loyalty and courageous leadership won David's trust as commander-in-chief of his armies, he also earned the king's curses for overstepping his authority by assassinating his own rivals against David's wishes. As an old man, Joab himself was finally assassinated at the orders of the newly enthroned King Solomon, following David's death-bed advice. Some of the treasure he had plundered in his military campaigns was so valuable as to be housed in the sacred Temple of Jerusalem that Solomon built, and his descendants remained prominent until after the Jewish exile and return from Babylon. Joab hailed from the same Bethlehemite clan as David and was the son of David's older sister, Zeruiah (1 Chronicles 2:16-17). At least two of David's other military commanders hailed from this clan: Abishai and Amasa. The family did military service under King Saul in his battles against the Philistines. However, by the time David and his followers were on the run from Saul, his nephews—specifically Abishai, but likely Amasa and Joab as well—had joined him. When he became king of Judah, David admitted and even lamented the degree to which he relied on Joab and Abishai for his power (2 Samuel 3:39). Joab first comes on the scene in the biblical narrative shortly after King Saul has been killed in battle. David rules as king of the Tribe of Judah while Ish-bosheth, son of Saul, rules over the northern tribes in Saul's place as king of "Gilead, Asher, and Jezreel; and also over Ephraim, Benjamin and all Israel." (2 Sam. 2:9) In a moment of apparent peace between the two camps, Joab meets Abner, Ish-Bosheth's general, at the pool of Gibeon. Abner proposes that their men engage in hand-to-hand combat, twelve against twelve. The fighting turns serious, with Joab's men gaining the upper hand. Joab's fleet-footed brother Asahel chases Abner, who does not want to engage him, for fear of creating bad blood with Joab and David. 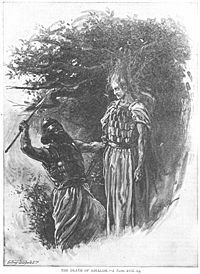 When Asahel refuses to give up the chase, Abner turns and slays him with a spear thrust. Joab's forces pursue Abner to exact vengeance, and the Tribe of Benjamin rallies to Abner's defense. Abner offers a truce, and Joab accepts. The casualties among Joab's forces are counted at 19 missing, while the number of dead among Abner's allies is 360. Although few details are given concerning the ongoing war between David and Ish-Bosheth, the struggle continued for several years. A major event in David's favor occurs when Abner, King Ish-Bosheth's top military commander, turns traitor and goes over to David's side after a scandal involving his alleged affair with the concubine of Ish-Bosheth's father, Saul (2 Sam. 3). As proof of Abner's good faith, David demands that he bring with him Michal, the daughter of Saul, who had been David's first love and young wife, but had later been given by Saul to another man. The fearful Ish-Bosheth allows both Michal and Abner to leave. Abner comes then to David at his capital of Hebron, bringing not only Michal, but also 20 soldiers and a pledge of loyalty from the entire Tribe of Benjamin, as well as elements of other northern tribes who have lost faith in Ish-Bosheth's leadership. David then dispatches Abner north to garner additional support for David's cause. Joab, learning of Abner's visit to Hebron, immediately sends messengers to recall him. When Abner dutifully returns, Joab stabs him in the stomach and kills him, ostensibly "to avenge the blood of his brother Asahel," but no doubt because he also senses in Abner a threat to his own position. David publicly declares himself innocent of the crime, cursing Joab's family and ordering him to publicly repent for the murder. However he does not demote Joab or otherwise punish him for his act. Ish-Bosheth, meanwhile, would soon be assassinated. Although David benefits greatly from this act, he again disassociates himself from it, and orders the assassins to be executed (2 Sam. 4). David arrives at Rabbah after Joab has paved the way to victory. Thereafter, Joab helps David to win major crucial victories against the Philistines, Moabites, Syrians, and Edomites. (2. Sam. 8) With his brother Abishai, Joab also wins a brilliant victory against a combined Ammonite and Syrian force, after which Ammon becomes a vassal state of David's kingdom (2 Sam. 10). "Put Uriah in the front line where the fighting is fiercest. Then withdraw from him so he will be struck down and die." Joab dutifully does as David instructs, and the innocent Uriah dies when Joab's men leave him unprotected in harm's way. After ensuring victory by seizing the town's water supply, Joab sends news to David, allowing his uncle and king the glory of conquering the city and receiving its king's crown. A series of easy military victories over other Ammonite towns quickly follows (2 Sam. 2:12). Joab also plays a key role in the drama of David's son Absalom. The charismatic heir-apparent to David's throne, Absalom had slain his half-brother Amnon after Amnon had raped Absalom's sister Tamar. Absalom was widely popular not only for his handsome appearance and winning personality but also for punishing the criminal when his father had been unwilling to act. For three years, David remains in a state of despondency over the matter. It is not until Joab conspires with a "wise woman" of Tekoa to manipulate David psychologically that the king finally comes to himself and allows Absalom to return. 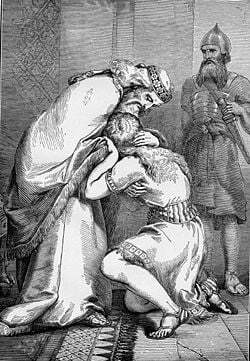 After two more years, with Absalom back in Jerusalem but still banished from the king's presence, it is Joab—under serious pressure from Absalom—who facilitates a reconciliation between them (2 Sam. 15). Within three years, however, Absalom has gained enough support to mount a serious rebellion against David, causing the king to abandon Jerusalem as Absalom approaches from Hebron with "all the men of Israel." (2 Sam. 16:15) Joab, perhaps demoted by David on account of his earlier support of Absalom, is placed in charge of one third of David's forces, another third being given each to Joab's brother Abishai and a Philistine ally of David's named Ittai. Still unwilling to act decisively, David gives orders that, in the fighting, Absalom must not be intentionally harmed. Once again coming to his senses only through Joab's intervention, David immediately goes out and takes his public place among his men. On his return to Jerusalem, however, David allows Amasa—his nephew who had led the army under Absalom—to remain in the position of commander-in-chief. Realizing his sin, David repents for commanding the census. Nevertheless, God reportedly strikes the land with a plague, which ends only after David purchases land from Araunah the Jebusite, builds an altar there, and offers various sacrifices (2 Sam. 24). Near the end of David's life, Joab miscalculates badly when he, together with the high priest Abiathar, supports the heir-apparent, Adonijah, in his bid to have himself named king while David is still clinging to life. While Adonijah, Abiathar, Joab, and several of the royal sons participate in a sacrificial feast nearby, Bathsheba and the prophet Nathan conspire to have Bathsheba's son Solomon named king by portraying Adonijah as a usurper. David immediately commands Nathan and another priest, Zadok, to anoint Solomon as his successor (1 Kings 1). On his deathbed David advises Solomon to act ruthlessly in consolidating power, especially toward Joab, remembering Joab's murders of Abner and Amasa. "Do not let his gray head go down to the grave in peace," David commands (1 Kings 2:6). Solomon moves against Adonijah and Joab after Adonijah's bold request to take David's young former concubine, Abishag, as his wife. Solomon has Adonijah assassinated immediately and exiles Abiathar to his home village of Anathoth. Joab seeks sanctuary at the sacred altar of the "tent of the Lord." Solomon then commands his man, Benaiah, son of Jehoiada, to strike down Joab where he stands, justifying the act on account of "the innocent blood that Joab shed." Benaiah does as he was ordered. Thus Joab dies clinging to the horns (horn-shaped front-posts) of the altar. Solomon rewards Benaiah by placing him in charge of the army in Joab's former place, while Zadok, who helped Solomon to the kingship, is made high priest. Joab is buried in a tomb on his own property. The Book of Chronicles adds the interesting note that Joab dedicated certain items of plunder that were considered holy enough to be placed in the Temple of Jerusalem after it was built (1 Cron. 26:28). Joab's family apparently remained prominent after his death for many generations, as the Book of Ezra lists 219 descendants of Joab, including their leader, Obadiah son of Jehiel, as returning from Babylon to Jerusalem after their exile. The scribal introduction to Psalm 60 preserves a tradition that this hymn was written on the occasion of Joab's victory over the Edomites in the Valley of Salt. The rabbis of the Babylonian Talmud hotly debated the character of Joab. Rabbi Abbah ben Kahana saw him as a great warrior without whom King David would not have been a truly great man. "If not for Joab," said Rabbi Abbah, "David would not have been able to occupy himself with the law." Said Rabbi Jehudah, the character of Joab's house was extremely righteous. "As a desert is free of robbery and adultery, so was the house of Joab." Rabbi Jehudah also affirmed Joab's generosity to the people of Jerusalem, whom he had recently conquered. "Joab supplied to the poor of that city everything to which they were accustomed." Because Solomon had Joab killed in a sacred sanctuary, Rabbi Jehudah held that all the curses with which David earlier doomed Joab fell on the descendants of David. Other rabbis, however, view Joab as a criminal. For killing Abner, Joab was brought before a court. He answered that he was the avenger of the blood of his brother Asahel. Asked why he killed Amasa, Joab replied: "He was a rebel to the king." These answers, however are not considered convincing. He is also criticized for his complicity in David's murder of Uriah and for his support of Adonijah's attempt to usurp the throne. Archaeologists today doubt that David's kingdom could have been as far-flung as suggested in the biblical account. For example, according to Israel Finkelstein (2006), evidence indicates that David's capital of Jerusalem was little more than a village in the late eleventh century B.C.E., and the population centers in the rest of Judah and Israel were not major cities, but towns at best. The grand scale of Joab's military conquests may therefore have been as exaggerated as the description of David's kingdom itself. This does not rule out that Joab was a historical character or the military genius who helped David maintain and extend his rule, however. Indeed, a close reading of the Joab narrative contains much information that challenges the conventional impression that David himself personally led most of "his" military victories. While Joab leads the siege of Rabbah, we see David at home in his palace, so bored with life that even his large harem does not satisfy him; and thus he commits adultery with the wife of Joab's lieutenant Uriah. As is often the case, Joab does David's "dirty work" by seeing to the murder of Uriah, while David seeks to make himself look innocent of wrongdoing. Only after Joab ensures victory does David ride out of his palace to claim the glory. Later we see David brooding in depression for years while Absalom remains estranged, ironically for acting much like Joab does—in taking action against a criminal (Amnon) whom David is too weak to punish. Later still, when David for once takes to the field with his troops, he is so absorbed in mourning Absalom that he cannot even join them in celebrating their victory, and once again Joab must come to his rescue. Indeed, one cannot help but wonder if it is primarily Joab's slaying of Absalom—rather than his murder of Abner and Amasa—that causes David, on this deathbed, to conspire with Solomon against Joab. As is often the case, the account in the books of Samuel and Kings give more embarrassing details about David and Joab than does the account in Chronicles, which omits the murder of Uriah, as well as Joab's allowing David the glory at the battle of Rabbah, and Joab's several rescues of David from the throes of depression and indecision. Biblical scholars often view the criterion of the "embarrassment" of a major figure such as David as tending to authenticate the historicity of certain biblical passages. The possibility of the heroic tradition of Joab existing as an independent one, later woven into the account, has also been suggested. This page was last modified on 13 March 2018, at 15:11.